Oh, the Oscars. Now, this is the awards show we’ve all been waiting for. 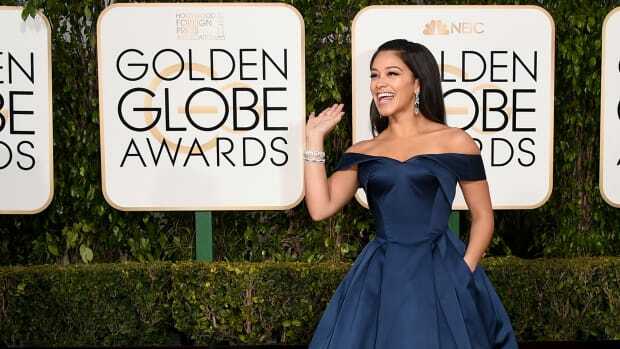 Hollywood’s biggest night for film is also highly anticipated by the fashion world, with gowns claiming just as much spotlight as the starlets donning them. 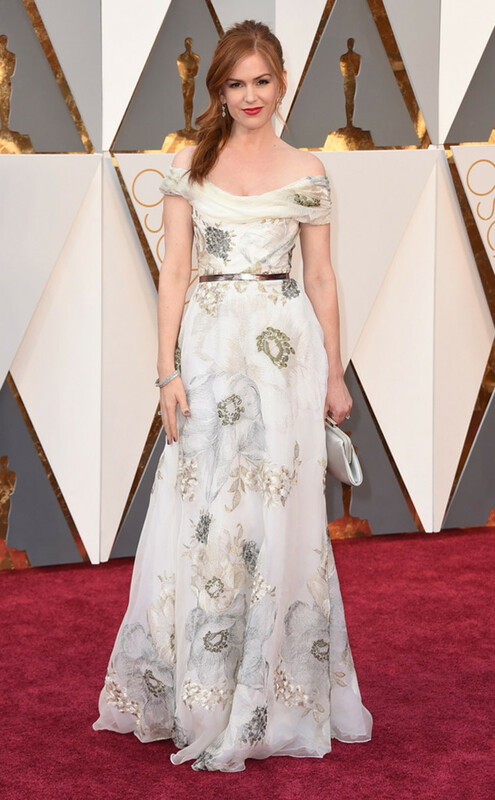 In the annual showcase of Hollywood’s finest decked out in fashion’s most regal designs, the 2016 Oscars red carpet did not disappoint. We oohed and aahed over every red carpet arrival, but some caught our eye just a bit more than others. We’ve rounded up a few of our favorite standout looks, just in case you didn’t get to see them last night (or if you’re back for a second or third look). Lady Gaga’s entrance into the acting world has been the perfect platform for debuting her evolved personal style. Gone are the meat dresses and alien-like ensembles, making way for more classic couture gowns that are innovative in silhouette and structure. We were stunned by Gaga in this striking Brandon Maxwell jumpsuit in pure white with a cascading skirt train. We love seeing Gaga as herself in these simpler yet breathtaking looks. Sofía Vergara’s trademark look of über-feminine flattering gowns certainly did not fail last night. She took her classic look up a notch in this rich navy Marchesa gown, looking absolutely radiant (as always). This dress is the meaning of extravagance with its intertwining of intricate beading, luxe fabric, and precise draping. Vergara always knows how to flatter her figure, making sure her waist is defined and highlighted by balancing it out with a flowing skirt and detailed bodice. 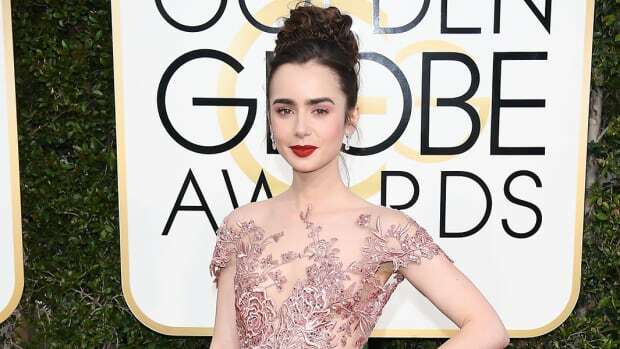 The red carpet is all about standout looks, but that doesn’t mean they all have to be ball gowns. Olivia Munn makes a bold statement in this simple and elegant Stella McCartney gown. It’s a runaway win for a flattering fit, but to turn the glamour up a notch, Munn chose bright orange. The bold color is beyond flattering for her skin tone, especially paired with that similarly hued lipstick. All in all, this gown is perfect for her. Isla Fisher is a dream in this off-the-shoulder A-line creation. This dress will make any girlie girl’s heart flutter with its princess-like silhouette and floral pattern. The classic silhouette is complementary to every body type, highlighting the waist and then flaring out in the skirt. Fisher’s half-up hairstyle and elegant neckline is positively ethereal. 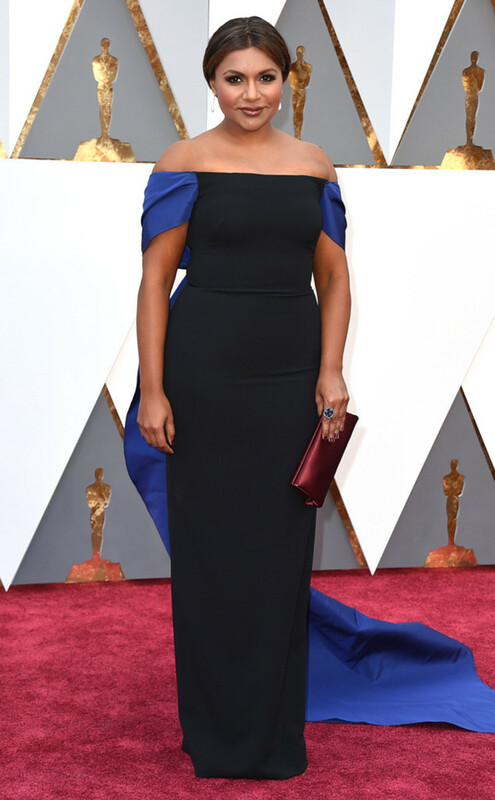 Mindy Kaling took our breath away in this sleek black gown, complete with a cobalt blue ribbon that ties in the back and turns into a train. This Elizabeth Kennedy number is simply elegant with its classic silhouette, but the train takes this gown to another level of couture grandiose. Kaling’s low bun and warm, smoky makeup suits her sophisticated ensemble, making this look a red carpet favorite. Armani Privé strikes once again this awards season with a gown of dazzling kaleidoscope colors, including deep blue, purple, pink, and red. Naomi Watts clearly feels as beautiful as she looks in this sleek, form-fitting gown. The painstaking details of the ombré colors in tiny sequins proves the quality of this gown, making it closer to a work of art than an average red carpet dress. It’s even more stunning in motion—we could stare at this look all day long. Tracey Edmonds goes Old Hollywood in this beaded white gown that perfectly flatters her curves. And who doesn’t love cap sleeves? Cap sleeves create a feminine silhouette and add the illusion of wider shoulders, which make for an hourglass proportionality. The floor-length beading is a classic gown look that we anticipate and love seeing every year. We always love to see a woman who knows how to flatter her skin tone. Alicia Vikander’s Louis Vuitton gown in buttercream brings out her warm tones and adds extra sparkle to her eyes. This dress is a classic representation of a red carpet look with its fitted strapless bodice, but the bubble skirt design is anything but typical. The bright yellow color is dressed up with the silver sequin details throughout, making this a winner for sure. Hollywood’s favorite girl next door made jaws drop in this sophisticated black Versace number. This is exactly the type of dress we expect to see on the red carpet with its A-line silhouette, cascading ruffles, and elegant one-shoulder sleeve. This regal dress is perfect for highlighting Garner’s natural beauty, and we couldn’t ask for anything more.